Some people quilt because their mother taught them how, or their grandmother brought them to a bee when they were little. Some people take it up as a new hobby to try when they have some extra $ and time. I learned because of a wonderful woman named Stacia. For the life of me I can’t remember her last name, just that she’s in Silverdale WA somewhere. Our daughters attended the same preschool at the local lutheran church down the street, and we began to chat one day when we were picking the girls up. I think the conversation began because my daughters name is Kaela and her daughter is Mykaela. The next day she invited me over. She lived across the street from the church. I was working overnights, so I slept in the morning after bringing my daughter to preschool, and then spent the time with her during the day, so that next day I went to Stacia’s house with my daughter to play. We lived sort of in the boonies. No sidewalks, no streetlights, no HOA’s. Lots of trees and overgrown grass and large lots. She had chickens running all over, and a big yard and garden. The house she was renting was old, built in the 1910’s. We chatted in the small kitchen for a while, getting to know each other. She told me about her hobbies and daily activities. She stayed at home with her 10 year old special needs child, her preschooler and baby girl. She told me about making quilts and canning the food from her garden and local markets. I was intrigued. The next time I went over to Stacias, she started showing me how to do these wonderful things. That year I won a blue ribbon for my strawberry jam in the Kitsap County Fair, and my canning days were cemented in my yearly routine. She also showed me how to make quilts, “country style”. What I mean is, she didn’t worry about squaring things up perfectly, or trimming or ironing between piecing to ensure everything was square. 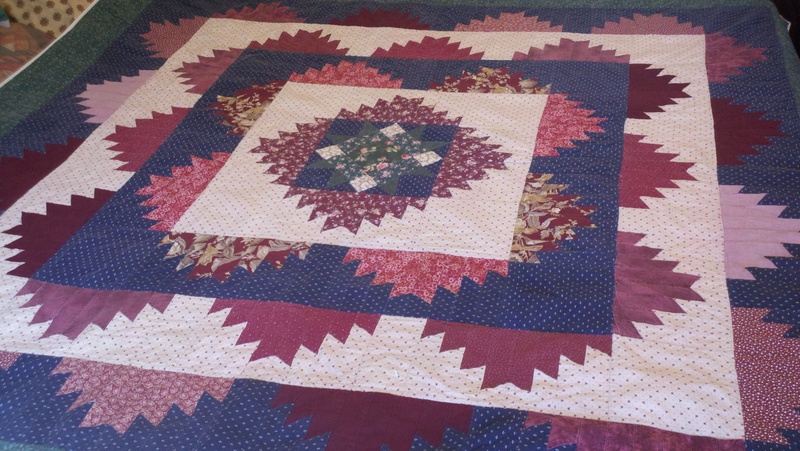 She sewed quilts for the comfort of her family and personal joy. And that’s what she showed me. Before we got into actually making a quilt together, she persuaded me to take a class at the local Joann’s, called Quilt In A Day: Delectable Mountains. Let me assure you this quilt is not made in one day. So that was my first quilt, and here it is! After that she showed me how to piece log cabin quilts, and patchwork quilts, which are pretty simple. She showed me how to sandwich and tie my quilts (which technically makes them coverlets, because quilts need to be quilted together), and how to bind the edges. About a year later, I bought a new machine. I had been using my grandmothers dinosaur and I think the timing failed. Regardless my little machine from Sears has held up just fine for the last 10 years. I began to focus more on the 1/4″ seam allowance (I was closer to 1/2″, which made my king size quilt actually measure queen sized). My point in this story is to share that we all come from different backgrounds in this hobby; we learn in different ways and we have different skill sets and preferences. 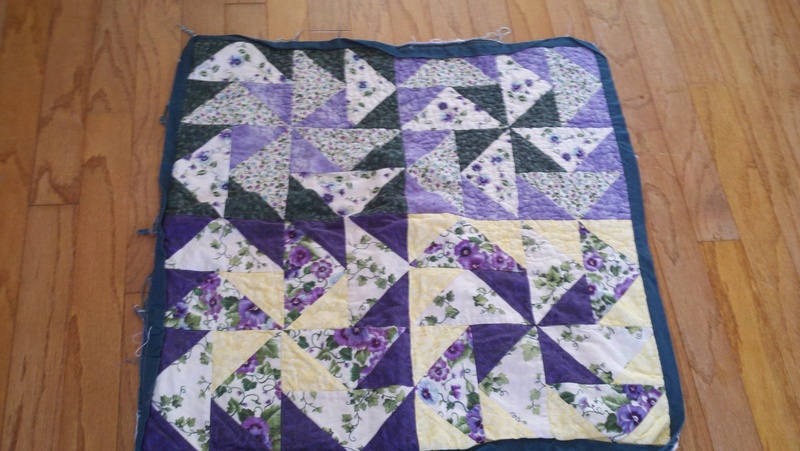 I love to quilt the way I learned (with a few improvements), rather than precision and paper piecing. I have my own style and it is far from perfect, and I’m good with that. So happy quilting my friends, whatever you are working on!